This post investigates the relationships between the percentage of a country's electricity from different (alternative) sources, the country's carbon emissions, and the price its households pay for electricity. The sample comprises the 34 OECD countries. Data on the percentages of electricity from different sources were obtained from the Energy Information Association. Data on carbon emissions were obtained from the World Bank. And data on electricity prices were taken from the OECD. All figures are for 2010; electricity prices were unavailable for Australia and Iceland. 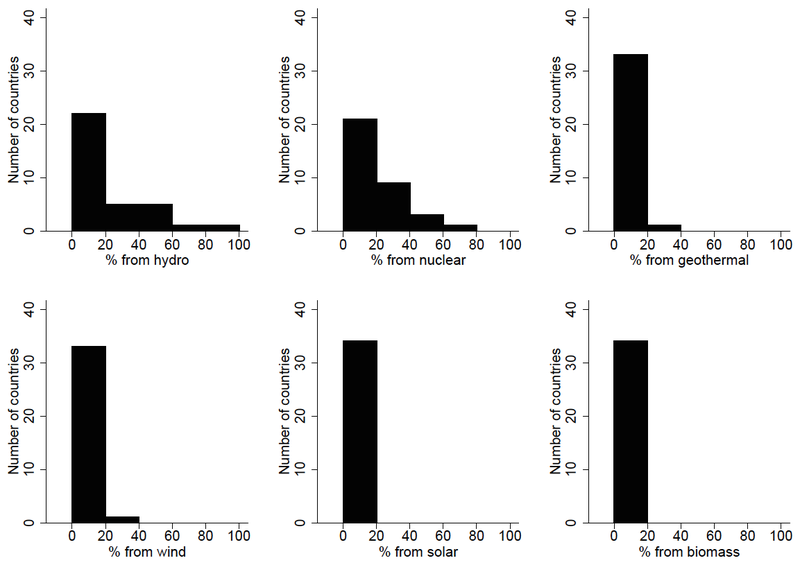 The chart below displays histograms of the distribution of countries by percentage of total electricity generated from six sources: hydroelectric, nuclear, geothermal, wind, solar, and biomass. The distributions for geothermal, wind, solar and biomass are heavily concentrated at the low end of the scale. Mean percentages of electricity from these four sources are, respectively, 1.3%, 3.4%, 0.3% and 3.9%. The distributions for hydro and nuclear are slightly less concentrated at the low end. Mean percentages of electricity from these two sources are 21% and 16%, respectively. Iceland is an outlier in the case of geothermal, generating fully 26% of its electricity from that source, while most other countries generate none. The first table (below) displays coefficients from linear regression models of carbon emissions per unit of energy used on percentage of electricity from different sources. Carbon emissions per unit of energy used was calculated simply as carbon emissions per capita divided by energy use per capita. For investigating which energy sources are associated with the highest carbon emissions across countries, emissions per unit of energy is a preferable measure to emissions per capita, since the former will be unaffected by differences in emissions that derive from wealth, population density and lifestyle factors. The second table (below) displays coefficients from linear regression models of electricity price for households on percentage of electricity from different sources. The first three columns contain non-significant negative coefficients, indicating that the electricity price does not tend to be higher in countries that generate more electricity from hydro, nuclear and geothermal. By contrast, the next three columns contain significant positive coefficients, indicating that the electricity price tends to be higher in countries that generate more electricity from wind, solar and biomass. 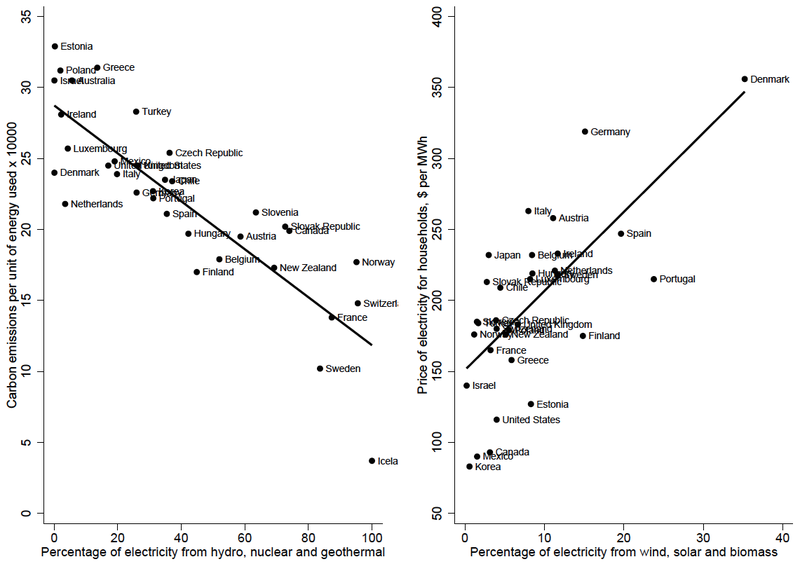 As the seventh and eighth columns show, respectively, percentage of electricity from hydro, nuclear and geothermal explains only 1% of the variance in the electricity price across OECD countries, whereas percentage of electricity from wind, solar and biomass explains 48% of the variance. The chart below displays, on the left, emissions per unit of energy against percentage of electricity from hydro, nuclear and geothermal (corresponding to the seventh column in the first table), and on the right, the electricity price against percentage of electricity from wind, solar and biomass (corresponding to the eighth column in the second table). Both relationships are strong as well as linear, though the correlation on the right does drop from r = .69 to r = .57 when Denmark is omitted. In conclusion: use of hydro, nuclear and geothermal tends to coincide with lower emissions per unit of energy but not with a higher price of electricity, whereas use of wind, solar and biomass tends to coincide with a higher price of electricity but not with lower emissions per unit of energy. It is important to note, of course, that these are simply cross-country associations, not causal effects. One possible reason why use of wind and solar does not tend to coincide with lower emissions is that, because these are intermittent sources of energy, they generally have to be backed up by alternative sources, which often means fossil fuels. On the other hand, it could simply be that countries which generate more electricity from wind and solar tend to generate more of the rest of their electricity from fossil fuels, rather than from hydro, nuclear or geothermal. This is a guest post written by Ask Foldspang Neve. Yesterday’s parliamentary elections in Denmark had what seem to some observers a paradoxical outcome: the incumbent Social Democrats increased their share of the vote by 1.5 percentage-points to 26.3%, becoming the largest of the nine parties represented in the Danish Folketing. However, they still lost power. That became clear as the parties willing to support a ‘red’ government led by the Social Democrats couldn’t muster a majority. Helle Thorning Schmidt resigned as Prime Minister and as party chairman immediately. In Denmark’s multiparty system, outright majorities for one party are extremely rare––the last occurred in 1890, before the introduction of both female suffrage and parliamentarism. Governments are not necessarily coalitions, although every government since 1982 has been so. Coalition or not, however, they usually rely on the parliamentary support of a ‘friendly opposition’, i.e., parties that will reliably support the government in key votes such as on the budget, but are not part of the government’s official program (agreed upon among coalition partners and published somewhat like the Queen’s Speech). Most often, the support of the friendly opposition is secure enough that even if such supporting parties do not take part in every law the government passes (private member’s bills are extremely rare), they will still make sure that the government stands, although often in return for some kind of policy compensation. Usually, the logic ensuring that the government is safe––even when it makes deals with the ‘real’ opposition that are unpopular among its supporting parties ––is that supporting parties lie further to the extremes of the political spectrum than governmental parties. Thus, even a ‘promiscuous’ government is often more attractive to a supporting party than the alternative of getting a government led by a party whose preferences lie even further away from oneself. The obvious situation where this might break down is if there is more than one dimension of salience represented in parliament. With 10 parties running for election, a low 2% threshold for entering, and a voting system that ensures a very high level of proportionality between votes and seats, Denmark has the institutional setup for expressing just that. A recent historical example occurred in the 1980s, when, during the Cold War, the Conservative-led government relied on the support of the anti-militaristic Social Liberal Party for support in budget votes. The Social Liberal Party, however, voted together with the left on defense issues, partially in defiance of Ronald Reagan. Thus, to remain in government, the Liberal Party foreign minister was forced to negotiate international treaties and policies that went against his own and the government’s will; the alternative would have been to call fresh elections, which the prime minister was unwilling to do over the issue. From the mid-1990s onwards, the two salient dimensions have been redistributive preferences and social attitudes––especially concerning migration and religion, but also crime (gay rights are only a very minor issue, and abortion is absent from the public discussion). European cooperation might mark a third dimension. In this year’s elections, 10 parties were running, 5 in each ‘bloc’ supporting a different candidate for prime minister. There are 179 seats in Parliament, of which 175 are elected in mainland Denmark, 2 on the Faroe Islands and 2 in Greenland. The latter 4 mandates are usually part of supporting a government in key votes if needed (according to their political alignment), but otherwise usually remain neutral. Thus, 90 mandates are needed for a majority. Yesterday’s results in mandates for each party and for the blocs are listed below. However, the Social-Liberal Party has traditionally been a ‘swing party’, and has participated in governments in both blocs. This is not least due to the party’s economic preferences, which align more closely with those of the Liberal Party and Conservative Party. On social issues, they are aligning mostly with the left at the same time as the Social Democrats have moved to vote with the right. Similarly, the Danish People’s Party have expressed that in order for them to support a Liberal-led government, the Liberal pre-election promise of freezing public expenditure must be reneged on: the Danish People’s Party’s economic preferences are to the left of the Liberal Party and maybe more closely aligned with the Social Democratic Party, from whom it has managed to take many voters. Thus, if parties votes according to this preference––without paying respect to supporting a government––we could list the mandates that could be mustered for each side on multiple dimensions. I have arranged them below. Thus, if parties paid no respect to office, we should expect to see agreements securing higher levels of redistribution, lower levels of immigration, and more European integration. By some measures, this has actually been the case in previous assemblies. Anders Fogh Rasmussen’s liberal governments saw increases in tax revenue as share of GDP (in a period when GDP growth was high) while his government was supported by the more redistribution-friendly Danish People’s Party. The Social Democrats are largely seen as having moved to the right on immigration, and Ms. Schmidt’s government made getting asylum more difficult, despite the protests of Social Liberal backbenchers and the supporting parties on the left. Finally, while Euro-skepticism has been growing, there is still a stable consensus about supporting the European Union and to resist calls such as those heard from Tory backbenchers for scaling back or even quitting the union. It shows why the Danish People’s Party might be doing so well: it is good at capturing voters who want more redistribution, but less immigration. It often seems isolated on European issues, which, however, is a dimension that is often less salient than the first and second dimensions. In this sense, the current election might not have changed much. However, governments matter: office spoils are important, and only governments can effectively initiate legislation in Denmark. Moreover, most parties obviously don’t fit well into a dichotomous description of any dimension of politics, and the above 3x2 matrix does not even allow for centrist positions. Nonetheless, the above data gives an impression of multiple dimensions at work in practice in a multiparty system––and of what to expect from the ongoing negotiations to form a government in Denmark. This is a guest post written by Simon Wan. Last week, George Osborne announced that he would entrench in law the government's commitment to run long-term budget surpluses. This is, admittedly, an ill-advised policy. But the response from Osborne's critics was even worse. In a letter published in the Guardian, a roll call of the government's main detractors on economic policy argued against the move. And in the process they broke one of the fundamental rules of social science––never reason from an accounting identity. The government’s budget position is not independent of the rest of the economy, and if it chooses to try to inflexibly run surpluses, and therefore no longer borrow, the knock-on effect to the rest of the economy will be significant. Households, consumers and businesses may have to borrow more overall, and the risk of a personal debt crisis to rival 2008 could be very real indeed. A little bit of background here: by definition the net financial asset (or debt) position of the total economy is zero because any debt owed by one person is someone else's asset. So, according to this line of reasoning, if the government reduces its net debt, then the rest of the economy (the private sector and, in particular, households) must be reducing its net assets, in the process becoming poorer and possibly even having to borrow more. First, there are some easy shots we can take at this argument. It ignores the existence of a foreign sector, which, in the UK's case, is not insignificant. Around 30% of outstanding gilts are held by overseas residents, meaning that any net saving by the public sector will at least partly be born by dissaving abroad. A point often made is that the last financial crisis was caused by global imbalances driven by persistent current account deficits in developed markets and savings gluts in emerging economies. Wouldn't lower borrowing in the West go some way towards remedying this? Furthermore, many countries run long-term budget surpluses without impoverishing the domestic economy. Norway, for instance, has one of the largest sovereign wealth funds in the world. The reason why this does not result in a large debt pile for Norwegians is of course that the country's oil wealth is invested almost entirely overseas. More importantly, accounting identities are truisms, making arguments based on them largely meaningless. The claim that reducing government borrowing will reduce private sector wealth is as spurious as saying that the government should borrow as much as possible so as to boost private sector wealth. What's gone wrong here of course is that we are not just talking about private sector wealth (or debt), we are talking specifically about the private sector's wealth with respect to the government. So, yes, reducing the state's debt will decrease the private sector's claims on the government, but there is no reason why this means households would have to borrow more. Certainly there is no reason why it would cause households to borrow more from each other or from private lenders. And of course, it is patently untrue that when governments pay back debt they are reducing the wealth of the private sector. Indeed, this just changes the composition of assets held by the private sector from bonds and bills into broad money. Taken to its logical conclusion, the argument presented in the Guardian letter would call for the government to privatise all its financial assets (since these are claims of the state on the private sector, and therefore selling them would raise the net wealth of the private sector with respect to the government). I don't see Messieurs Chang, Piketty or Murphy enthusiastically calling for the British government to sell its remaining stake in Royal Mail. Following on from several commentators' articles, I noted recently that the counties and commuting zones located in fracking states tend to have high rates of upward mobility for boys, as measured by Chetty et al. 's new estimates of the causal impact of growing up in different areas of the US. 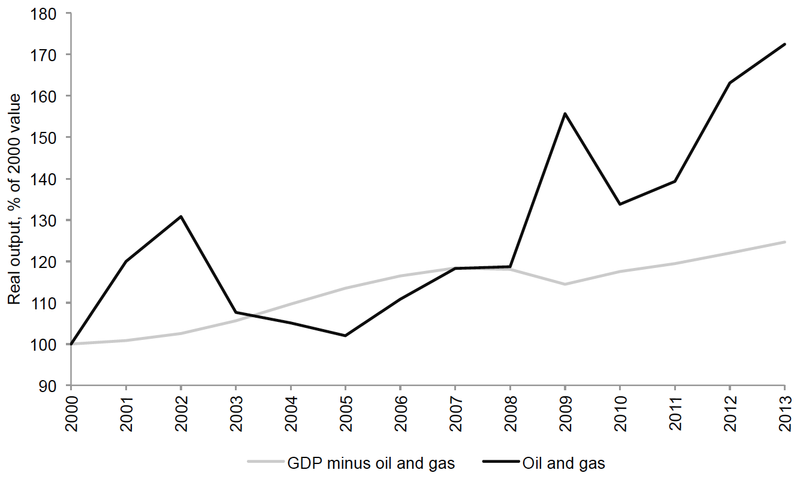 Here I examine whether fracking states have experienced more economic growth since 2005 than non-fracking states, again defining fracking states as those in which >1,000 fracking wells have been drilled since 2005. The chart below plots the percentage growth in real GDP per capita since 2005 for the 50 states, using data from the Bureau of Economic Analysis. Fracking states are overrepresented among those that have experienced the most per-capita economic growth since 2005. 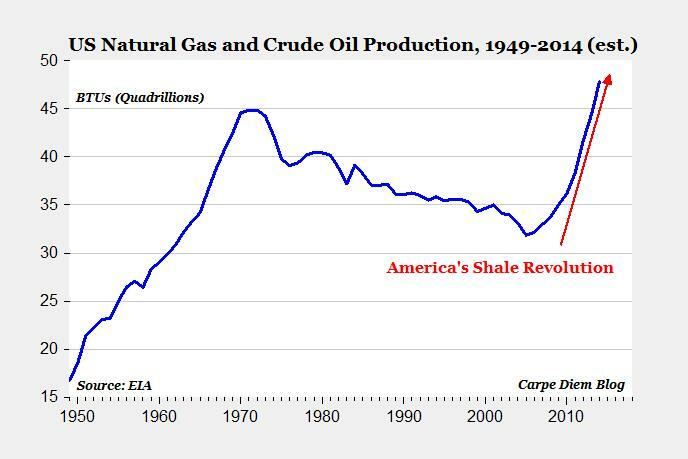 On average, fracking states grew by 10.7%, whereas non-fracking states grew by only 1.3% (t-test: p = 0.008). 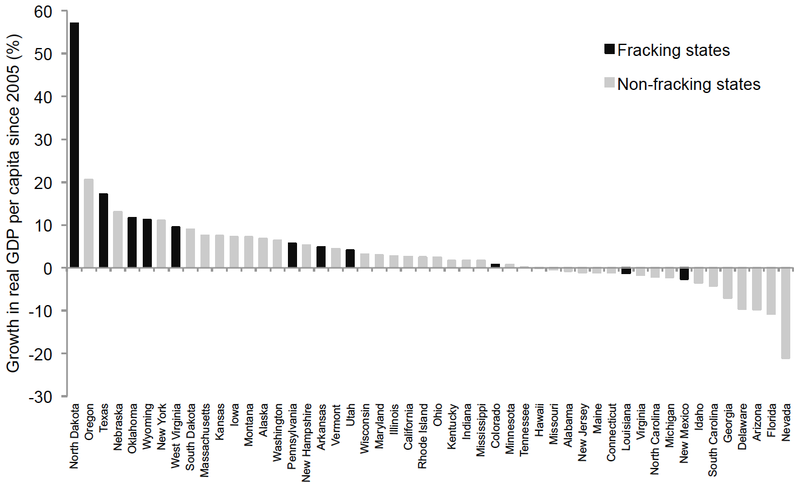 Excluding North Dakota, which is obviously something of an anomaly, fracking states grew by 6.1% (t-test: p = 0.061). As noted in the discussion of upward income mobility, North Dakota sits atop the heavily fracked Bakken shale, which likely helps to explain its extraordinary growth of 57%. Since 2005, US real GDP per capita has increased by 4.8%, meaning that North Dakota grew by 52 percentage-points more than the country as a whole. Indeed, based on data from the IMF, if North Dakota were a separate country, it would have been the 19th fastest growing country in the world over the relevant time period, putting it at the 90th percentile of the global distribution. In a post a couple of days ago, I compared British opinion on the EU to opinion in other members of the EU-28, based on data from the most recent round of Eurobarometer. I reported that Britons have some of the least sanguine views of the EU, consistently ranking below the vast majority of member states, and trailing only Cyprus and Greece. The table below displays the actual percentages of Britons endorsing the various statements corresponding to the survey questions I examined. For three out of the five questions (image of the EU, feeling of EU citizenship, belief about a future outside the EU), opinion is evenly split. In one of these cases (image of the EU), there are a considerable number of undecideds. It is particularly noteworthy that only 50% of Britons feel they are citizens of the EU, given that anyone with British citizenship is perforce a citizen of the EU. For the other two questions (trust in the EU, voice in the EU), opinion is quite heavily skewed against the European Union. In both these cases, there are relatively few undecideds. A caveat regarding the question on trust is that responses are almost identical when the question is framed with respect to the national government: 31% of Britons tend to trust it, while 62% tend not to trust it. This post examines Europeans' attitudes toward the European Union, using data from the latest round of the Eurobarometer, which was carried out in November of 2014. For each of five questions that capture citizens' overall appraisal of the EU, I examine the UK's rank relative to other members of the EU-28. The results are highly similar if data from the previous round of the Eurobarometer are used instead. In general, does the EU conjure up for you a very positive, fairly positive, neutral, fairly negative or very negative image? Responses were aggregated into two broad categories: "positive", comprising answers of "very positive" and "fairly positive"; and "negative", comprising answers of "fairly negative" and "very negative". With respect to "positive", the UK is ranked 26th, ahead of Cyprus and Greece. With respect to "negative", the UK is ranked 4th, behind Austria, Cyprus and Greece. I would like to ask you a question about how much trust you have in certain media and institutions. For each of the following media and institutions, please tell me if you tend to trust it or tend not to trust it: The European Union. There were two main response categories: "tend to trust", and "tend not to trust". With respect to "tend to trust", the UK is ranked 26th, ahead of Cyprus and Greece. With respect to "tend not to trust", the UK is ranked 3.5th equal with Spain, behind Cyprus and Greece. Please tell me to what extent you agree or disagree with each of the following statements: My voice counts in the EU. Responses were aggregated into two broad categories: "agree", comprising answers of "totally agree" and "tend to agree"; and "disagree", comprising answers of "totally disagree" and "disagree". With respect to "agree", the UK is ranked 21st, ahead of Spain, Portugal, Estonia, Italy, Greece, Latvia and Cyprus. With respect to "disagree", the UK is ranked 7th equal with Spain and the Czech Republic, behind Latvia, Italy, Portugal, Greece and Cyprus. For each of the following statements, please tell me to what extent it corresponds or not to your own opinion: You feel you are a citizen of the EU. Responses were aggregated into two broad categories: "yes", comprising answers of "yes, definitely" and "yes, to some extent"; and "no", comprising answers of "no, not really" and "no, definitely not". With respect to "yes", the UK is ranked 26nd, ahead of Italy and Greece. With respect to "no", the UK is ranked 4.5th equal with Cyprus, behind Italy, Bulgaria and Greece. Please tell me to what extent you agree or disagree with each of the following statements: Our country could better face the future outside the EU. Responses were again aggregated into the two broad categories of "agree" and "disagree". With respect to "agree", the UK is ranked 3rd, behind Slovenia and Cyprus. With respect to "disagree", the UK is ranked 28th. In conclusion, Britons appear to have some of the least sanguine views of the EU, along with Cypriots and Greeks. It is important to note, of course, that current opinion polling in the UK puts staying in about 5-10 percentage-points ahead of getting out. Yet the balance of public opinion on the EU has moved rather erratically over the last decade or so; just three and a half years ago in 2011, getting out was about 5-10 percentage-points ahead of staying in. In addition, given the connotations of getting out with UKIP and with nationalistic politics more generally, there may be a sizeable number of shy eurosceptics out there.